There is apparently scientific evidence that getting 'knocked-up' shrinks your brain - if that's the case then raising your offspring only makes you realise you didn't know sh*t in the first place. I find 3-4-year-olds to be random little people with moments of cognitive brilliance peppered with episodes of psychotic, simian behaviour. We'd had a sh*t week, quite literally, since we had a broken sewer pipe shared by all 4 Victorian terraces in our row. I found myself on Wednesday juggling a crazy child and a plumber who was dealing with a river of sewerage running down our newly paved side passage. And while getting stuck into my new job as ‘involuntary strata manager’ led me to getting stuck into the Xanax, I had some lovely moments with my little girl as we replaced our afternoon bike ride to the park with a new stay-at-home game: 'chemical clean-up'. You know she's quite a dab-hand with a mop my girl. So long as lots of bubbly detergent was involved she was overjoyed at the idea of swabbing the deck, which fortunately was only desecrated by the plumber's boots, while I tossed litre after litre of disinfectant, then bag after bag of top soil around the lower garden. "What's that smell? It's disgusting! "; one of her new favourite phrases, had a lot of air-play until the disinfectant finally overpowered the previous stench. Her speech has come along nicely, since she started with a speech pathologist; albeit sometimes embarrassingly so. Like the time she pointed an accusing finger at an unfortunate looking elderly man in our doctors waiting room, crying “That man scares me mummy!” I don’t know who was more mortified, me or the poor old man with the great-face-for-radio. And then there’s the joyful and loud descriptions of all her bodily functions: - During a speech pathology session: “I’ve got an itchy bum, Tiffany!” Both Tiffany and mum had to take a minute before being able to respond to that one, but it was quite good as far as sentences go. Someone somehow had turned up her volume. The operator was still laughing when I picked up the phone again. 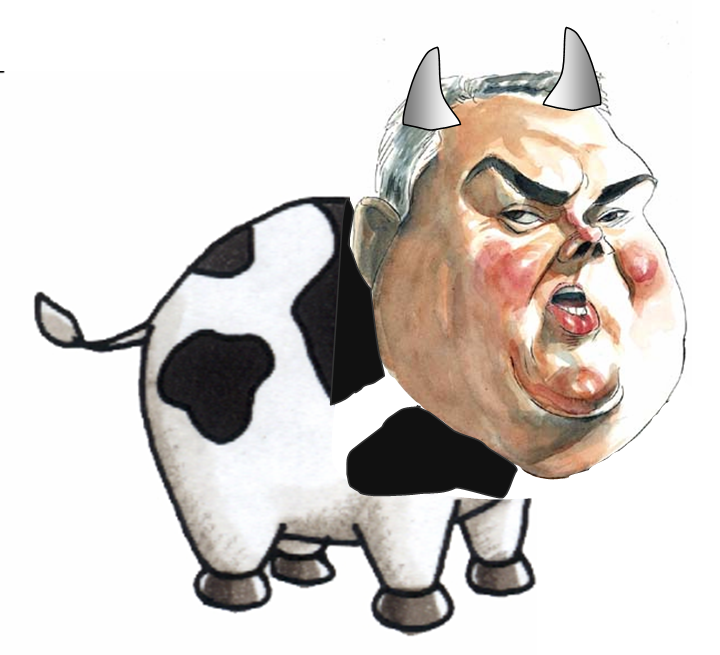 And then the evening she turned political commentator: catching the early news on TV she took one look at our Shadow Treasurer, Joe Hockey, and shouted 'Go away cow!'. We didn’t know that Lucie needed help with talking; being in a bilingual family we expected her speech to be delayed that’s what ‘they’ say isn’t it? If you are in any doubt about your little wrangler I suggest you take a look at Speech Pathology Australia. You can read fact sheets online, download resources and look for practitioners in your area. It will either give you peace of mind or set things straight before it impacts their schooling and social skills. Lucie's speech therapy is coming along nicely- her best sentence this week during the session: "I’ve got an itchy bum, Tiffany" (which was accompanied by a helpful demonstration). Another personal favourite is " Don’t taste poohs, it's yucky". Ok I have finally posted our first craft project online if you haven’t noticed: turning glove puppets into hobby horses or hobby giraffes, elephants etc. Still coming (yes, and so is Christmas!) a are the puppet socks – anyone who can sew on a button can make therm and I’ve found them very useful in the ongoing offensive against eczema- considering you can’t buy cotton gloves in anything but adult sizes. Ha ha, I just snorted my drink! How cool to be a bilingual family! My daughter's speech was delayed but she's made up for it now! My 2.5yo is now terribly articulate and tells me I have stinky poo poo breath every morning, charming! I just snorted MY DRINK!!! !